The Big Boy tomato (F-1 hybrid) has been a popular variety for over 50 years. It first appeared in a Burpee catalog in 1949, and in fact was Burpee's second ever hybrid and still a Burpee best-seller. The designation F1-Hybrid tells you this variety has been cross-produced from two distinct "pure" tomatoes. Because 'Big Boy' is an F1, or first-generation hybrid, it should have better-than-average vigor and give more uniform and bigger yields. But if you save seeds for next year you'll probably not be able to recognize, or like, the tomatoes produced. The Big Boy has a very good sweet flavor and a fragrant aroma. The fruit is a deep red with a firm, juicy interior with thick walls. The plant is an indeterminate (tall growing, continuous bearing) variety but its growth habit is bushy. It is a hardy plant and has good disease and crack resistance. It's also a prolific producer, and not unusual to grow one-pound fruits. 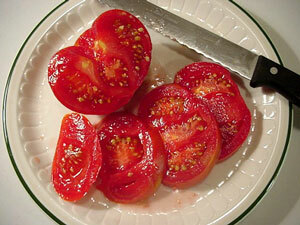 Tomatoes are easy to grow from seed, but Big Boy seedlings are frequently available at nurseries. Plant after all danger of frost has passed. Many U.S. cities are listed in When to Plant Tomatoes. Disease Resistance: Alternaria Stem Canker and Crack resistance.